Sometimes we need higher sound output from Audio based circuits using either Buzzer or Speaker. 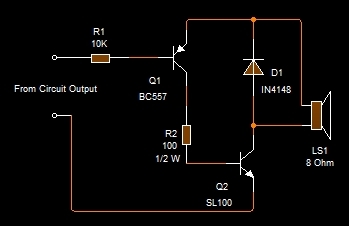 This simple Transistor based Audio amplifier will give loud sound from the Speaker or Buzzer. Two Transistors are used as ” Darlington Pair” Q1 is a general purpose PNP Transistor and Q2 is the Medium power NPN Transistor. So their combination amplify the sound to its maximum.